January 4, 2019 (La Mesa) — Heartland Fire & Rescue crews dispatched to a residential fire at 11:40 last night arrived to find a single-story home with heavy smoke and fire in the 4700 block of Maple Avenue in La Mesa. February 20, 2018 (La Mesa) – Firefighters from Heartland Fire and Rescue, aided by San Diego Fire Department, saved an elderly and disabled man from a burning apartment building Tuesday night in La Mesa. Crews responded to the blaze in the 7300 block of La Mesita Place around 6:45 p.m. after receiving reports of black smoke coming from underneath an apartment door, with an elderly couple inside. The fire was in the living room of their downstairs unit. January 2, 2018 (La Mesa) – A female seen running from the scene of a small brush fire on a hill in the Eastridge area of La Mesa today has been detained for questioning by the Sheriff’s department. Heartland Fire and Rescue, along with San Miguel Fire and San Diego Fire Departments responded to the blaze that began around 1:25 p.m. Crews arrived within four minutes to find a 20 by 40 foot spot fire on a slope along High Street near State Routes 125 and 94 that grew to approximately an acre before crews halted the forward spread a half hour later. November 23, 2017 (La Mesa) – A fire on Thanksgiving morning caused $250,000 in damage to a home and its contents in the 3800 of Carbo Court in La Mesa. According to ECM news partner 10 News, Karla Fierro and her boyfriend helped her three children escape the fire, along with their dog. With help from a neighbor, they also evacuated a paralyzed man whom her boyfriend is caretaker for. The disabled man and his caretaker were treated at a hospital for smoke inhalation. February 2, 2014 (La Mesa) -- Heartland Fire and Rescue, assisted by San Diego and Cal Fire crews, are working a residential duplex structure fire in the 4700 block of 4th Street in La Mesa. April 26, 2013 (La Mesa)—Jackson Pavlicek of La Mesa is under arrest for reckless burning of property. According to La Mesa Police, Pavlicek extinguished a cigarette in the backyard of a home in the 9600 block Dillon Drive on the Grossmont Knoll, igniting dry brush. The fire quickly spread to the house and also damaged the roof of a neighboring home, as well as trees and fences. Heartland Fire & Rescue crews from La Mesa, Lemon Grove and El Cajon, as well as units from Santee, San Diego and Cal Fire, had the fire fully contained in about one hour. The blaze sent smoke billowing forth that was visible from State Route 125. A brush fire that began near High Street at Buena Vista Avenue in La Mesa tonight briefly threatened homes and sent smoke billowing up that was visible on SR-94. The fire was quickly doused by Heartland Fire, however High Street is closed for mop-up. Update: Firefighters have extinguished the fire and limited damage to $10,000. Evacuations of neighboring businesses were done and Hazmat called as a precaution, however no chemicals were found to have burned. 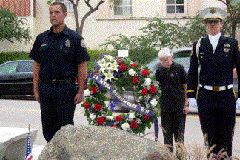 September 1, 2011 (La Mesa)--The City of La Mesa will host a remembrance ceremony on the ten year anniversary of the tragic events of September 11, 2001. A memorial wreath will be placed at the 9/11 Memorial at Fire Station 12, 8844 Dallas Street. 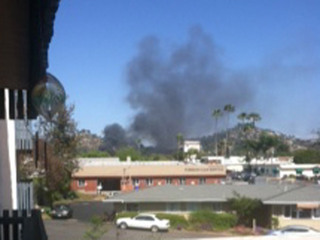 July 17, 2011 (La Mesa) – A fire has displaced seven residents at a triplex located at 5055 Thorne Drive in La Mesa. Heartland Fire & Rescue in La Mesa responded to a call at 3 p.m. and found smoke pouring from one of the units. July 9, 2011 (La Mesa) – Fire investigators remain on the scene this morning of a fire that started in an apartment building late yesterday and spread to a nearby home t 4759 70th Street. May 25, 2011 (La Mesa)-- Firefighters from Heartland Fire & Rescue in La Mesa responded to a fire last night at 9:56 p.m. in the 5700 Block of Baltimore Drive. Upon arrival, the second floor condo was well involved in fire and the fire was extending to the third floor. May 5, 2011 (La Mesa) – Heidi Durfey, 24, has died after her sports utility vehicle (SUV) with her three young children inside rolled backward 60 feet and ran over her. The tragedy occurerd on the driveway of her home in the 8700 block of Glenira Avene in La Mesa around 9:20 a.m.
She became caught under the SUV as it rolled and was dragged beneath the vehicle. “It came to rest in the street with the front end of the vehicle on top of the victim’s head and chest,” said Sonny Saghera with Heartland Fire & Rescue. December 15, 2010 (La Mesa) – An early morning fire at 4:30 a.m. Monday resulted in the death of a cat and sent the owner to a hospital with respiratory problems sustained while trying to locate her pet in a smoke-filled apartment unit. November 19, 2010 (La Mesa)--On October 2, 2010, at approximately 5:15 p.m., Richard Morse, 59, of La Mesa collapsed outside the beer garden at the annual La Mesa Oktoberfest. An off-duty Pasadena firefighter and a Scripps Hospital nurse witnessed Morse collapse and determined that he went into cardiac arrest and began CPR. Two La Mesa Firefighters, Captain Todd Feneis and Captain Steve Pullen were working EMS Bike Patrol and responded to the incident. 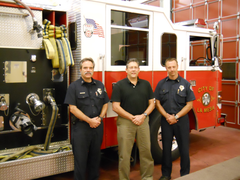 October 7, 2010 (La Mesa) – A fire at 4651 Pomona Avenue in La Mesa caused an estimated $75,000 in damage to a garage and its contents. Heartland Fire & Rescue arrived on the scene at 12:10 p.m., three minutes after receiving a call, to find fire engulfing a detached garage behind a home. As fire crews stretched hose lines to attack the fire, flames began spreading to a neighbor’s fence and vegetation. Bring the family and join the La Mesa Firefighters for a morning of fun at their annual Pancake Breakfast, June 19 from 8:00 a.m. to noon. Tickets, $5.00, will benefit the Muscular Dystrophy Association, and can be purchased at La Mesa Fire Stations or at the door the day of the breakfast. Breakfast will include pancakes, eggs, sausage, orange juice and coffee. The breakfast will be held at La Mesa Fire Station 11, 8034 Allison Avenue, La Mesa CA 91942. May 10, 2010 (Spring Valley) – Fire gutted an apartment unit at 3613 S. Bonita in Spring Valley this evening, though a swift response by multiple fire agencies saved adjoining units. Anxious residents, some in pajamas and one in a wheelchair, gathered outside as firefighters conducted a search of the building. No one was found inside and no injuries were reported. “When I came home and opened the door, there was smoke,” said one occupant of the unit, who asked that his name not be published. “I broke open a fire extinguisher and saw a fire in a trashcan, then I called 911.” Four residents in his unit and a dog were displaced by the fire, he said. November 16, 2009 (San Diego’s East County) – A series of water main breaks in East County over the weekend have led some area residents to ask what’s caused so many infrastructure failures. On Friday, November 13th, a water main break at the corner of La Mesa Blvd. and 4th Street sent large amounts of water flowing down La Mesa Blvd. and Allison Ave., causing damage to at least two businesses including the new Bella Mesa Art Gallery. Heartland Fire dispatched a response at 11:29 a.m. Fire crews closed roads and evacuated some businesses and restaurants. But damage could have been worse. July 10, 2009 (El Cajon)--Shortly after 12 noon El Cajon Fire crews responded to a house fire at 861 Grossmont Avenue in El Cajon. As fire crews responded, a large plume of smoke could be seen at a distance, and when they arrived on scene, flames were shooting from the windows.